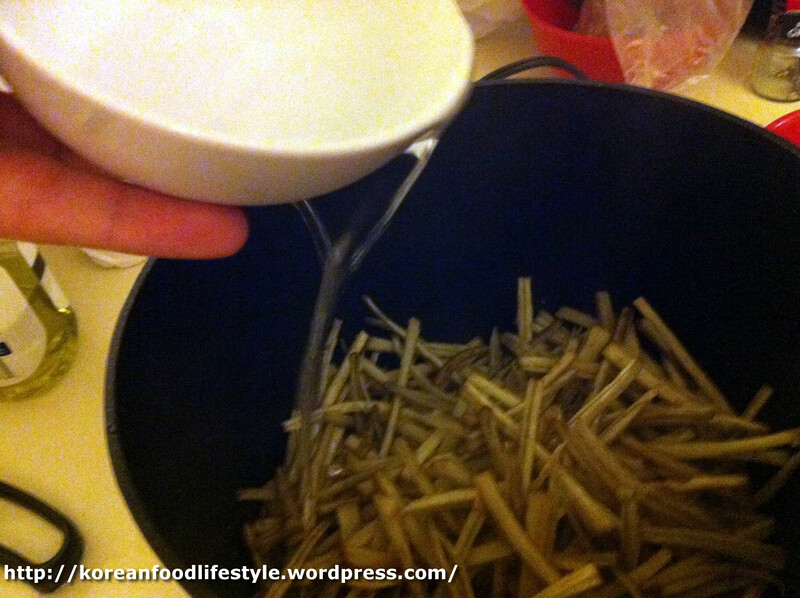 This is one of my favorite banchan, and it’s a flavor that you will find in many places across the Korean cuisine. It’s a little sweet, a little salty, and a little nutty. This vegetable is not normally seen on your average American dining room table, but it is healthy and tasty. 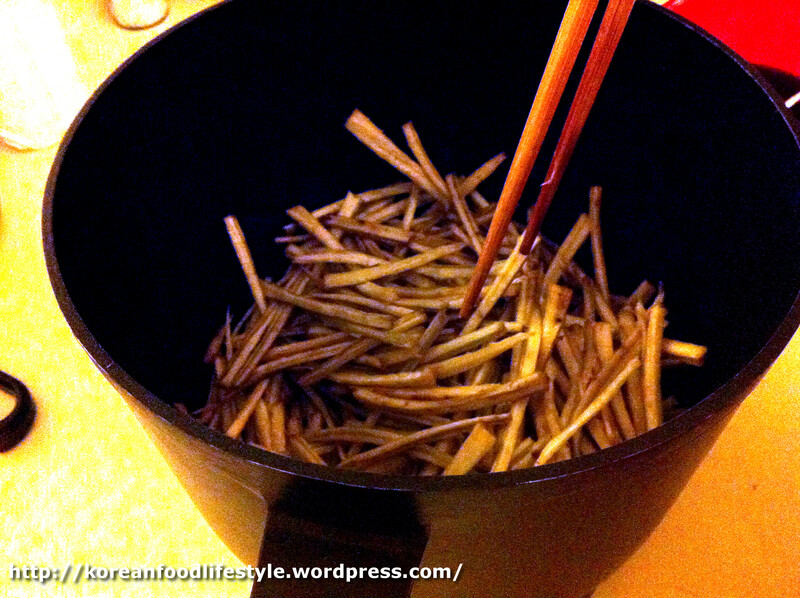 The root is often used in various natural medicines as well. 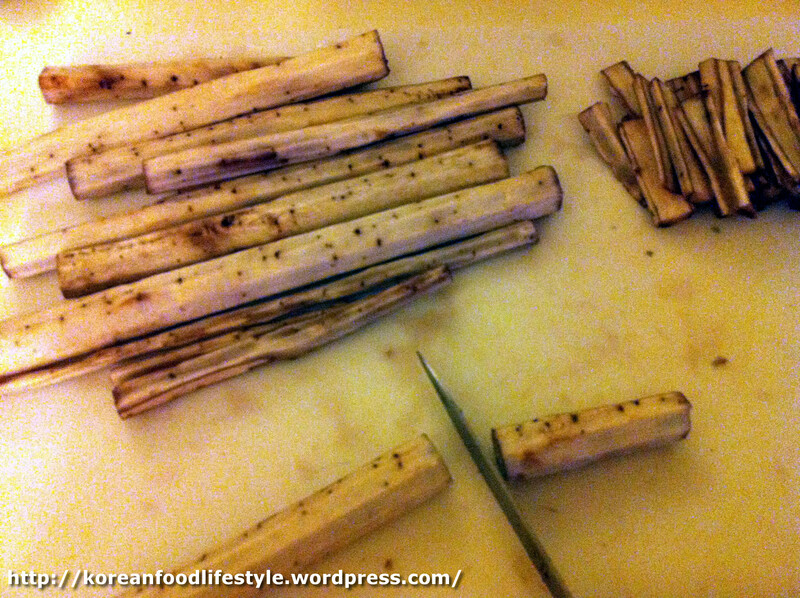 Cutting the root into fine pieces is the hardest part and can get a bit time consuming, but after that it’s just watching the pit simmer and stirring once in a while. When you buy the root it should look something like this. Rough and like a giant carrot. It will probably be wrapped in the store, and the inside should be a little moist when you cut it. 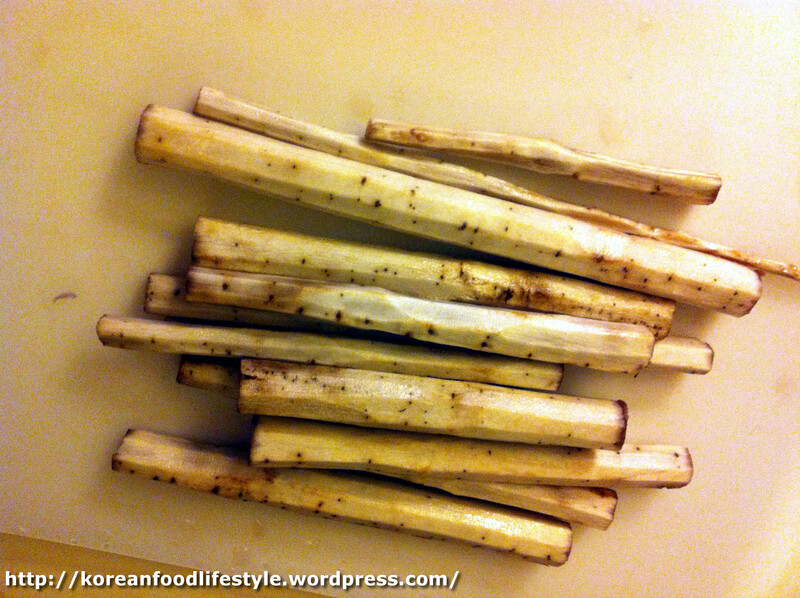 Cut the root into pieces roughly 6-10 inches long. 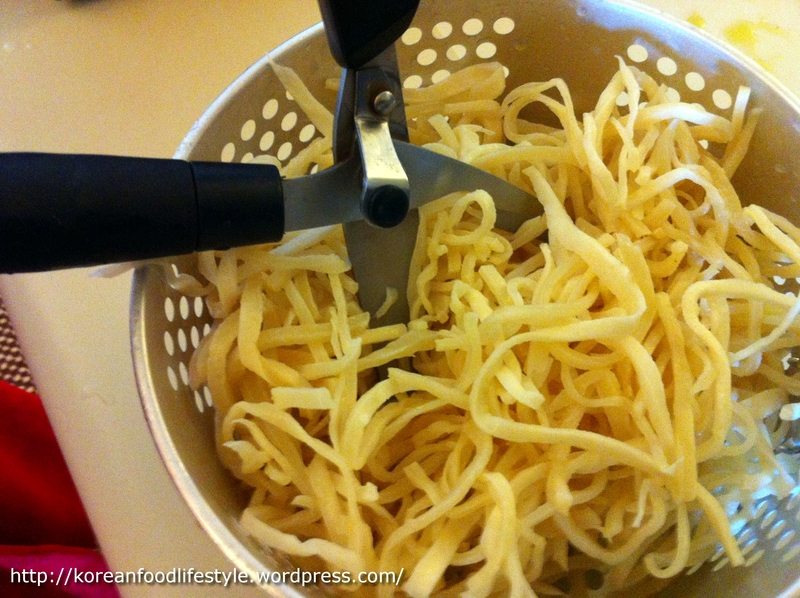 Using a hand peeler, take the skin off each piece. It should come off rather easily. 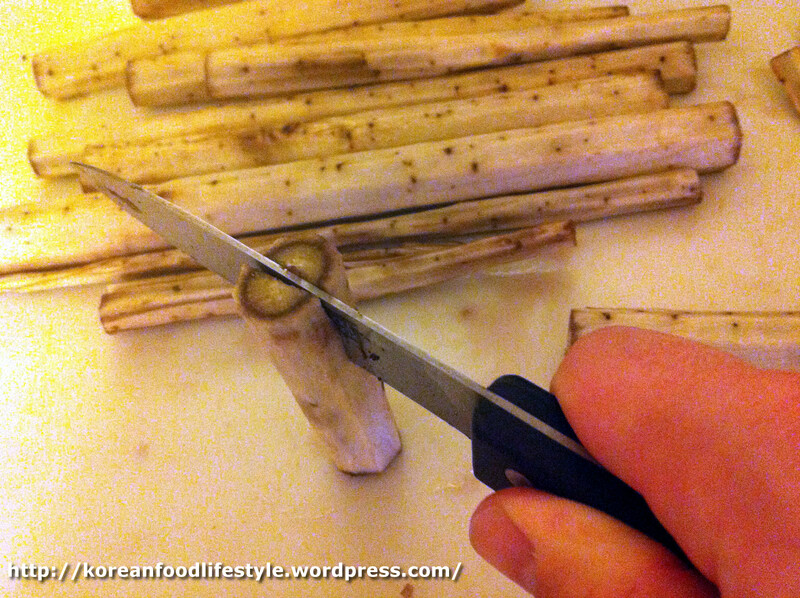 Take the pieces and cut them into smaller segments about 3 inches long. The cut the pieces in half. Take each half and cut them in half again. Sometime they are a bit hard to deal with at this stage. But the skinnier you can cut them, the more flavorful they will be. 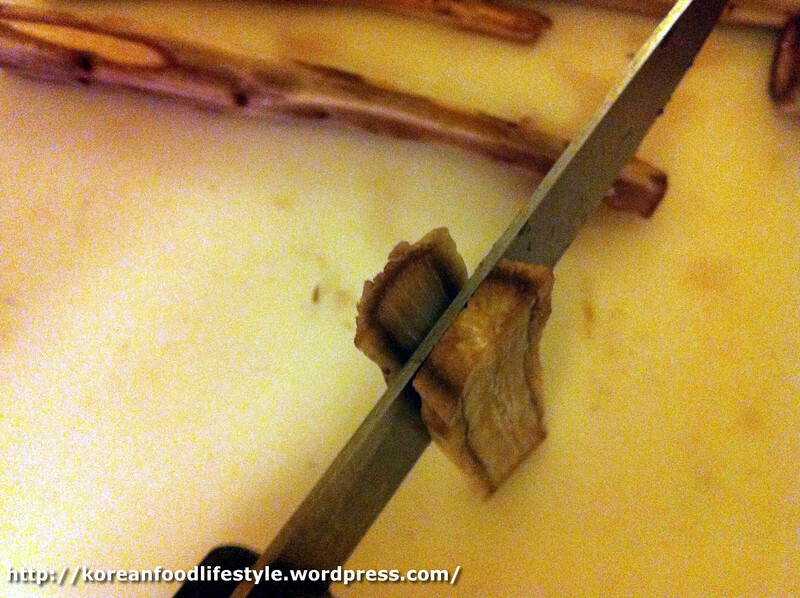 Take the individual pieces and cut them into small skinny strips like this. I find that it is easier to do this A. With another person helping so it doesn’t take so long and B. in an assembly line type method: cut them all in half, then all in half again, then all into strips. 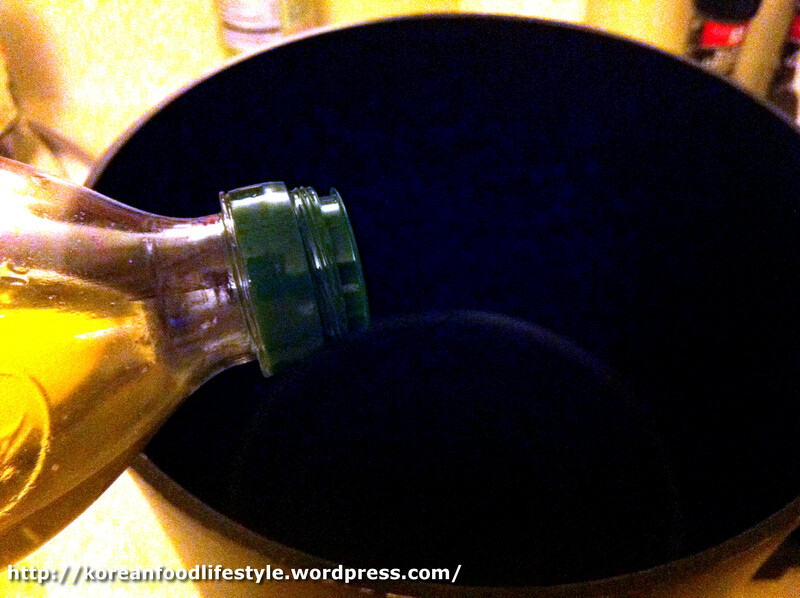 Meanwhile, have a large bowl that you fill with a bit of water and put the amount of vinegar in. I would put them in the water to soak as soon as you get them cut. They should soak for about 10 minutes after the last one is in there. The root has a tendency to be a bit tart and the vinegar bath reduces this a bit. 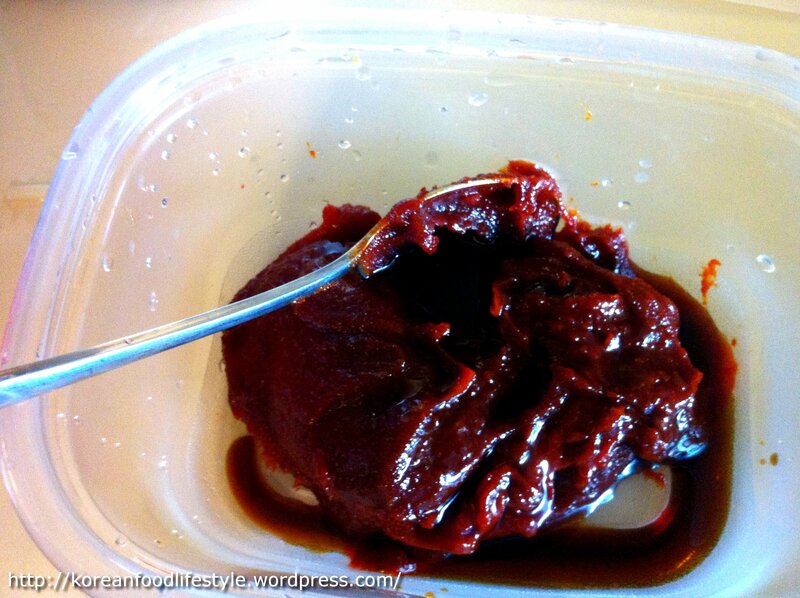 After soaking, rinse all the vinegar water off the pieces. 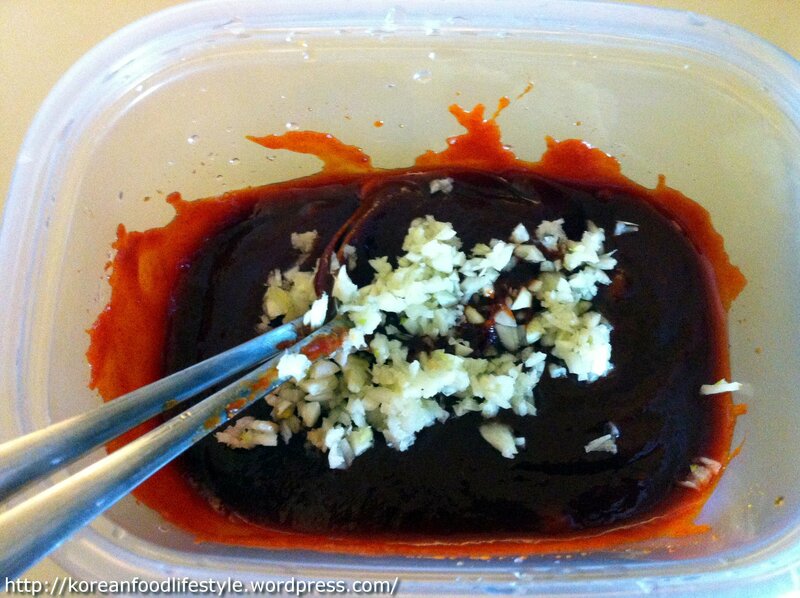 At this point you can make your marinade in a separate bowl using the sugar, simple sugar, cooking wine, and soy sauce. 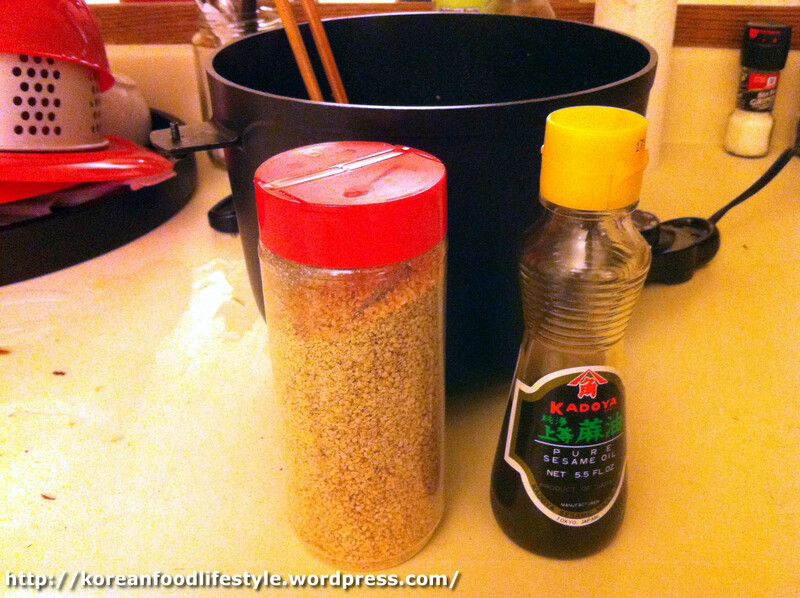 Remember the sesame oil always comes last so don’t put it in now. Put some oil in your frying pan. It needs to be a frying device that has a lid. 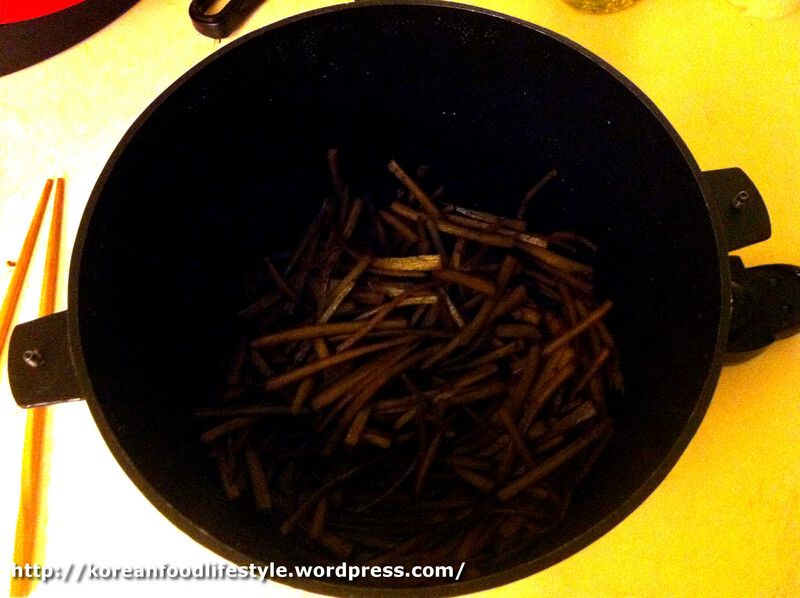 Put the cut burdock root in and fry for about 5 minutes in a medium heat. Cover and let it simmer, just barely steaming, with the lid on for about 30 minutes. Stirring every few minutes. At this point you want to check it. Depending on your heat you may have to adjust a few factors. You may have to add a bit of water if it starts to run out before the 30 minutes is up. After 30 minutes, if there is some liquid still on the bottom, open the lid and continue to stir and simmer until the water is gone. The root really takes on the flavor at the end, as the last of the marinade is being soaked into the root, so be sure to keep stirring at this point. 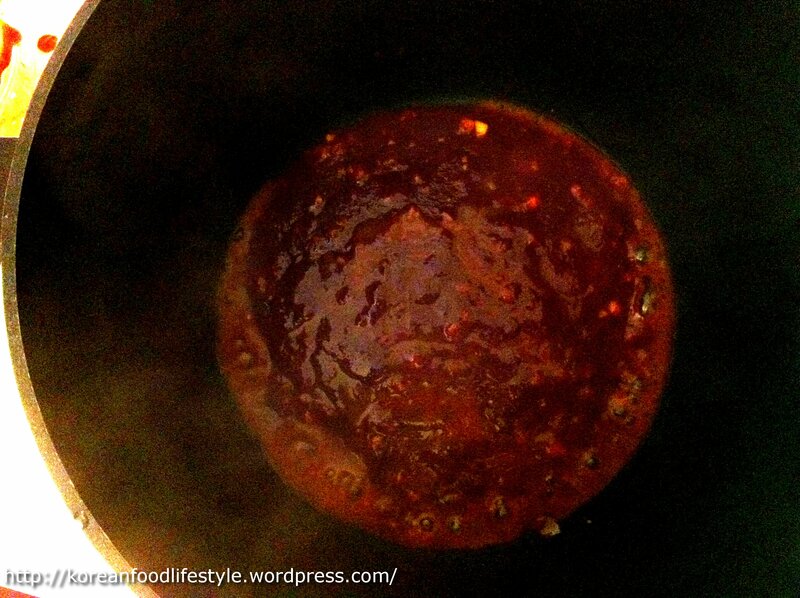 Not, when it is finished, turn off the heat and add the sesame seeds and sesame oil. Try it out. It should be a tad bit crunchy but at the same time kind of soft. It will get a bit softer the longer you keep it in the fridge don’t worry. Store in a good sealed container, and enjoy with rice! 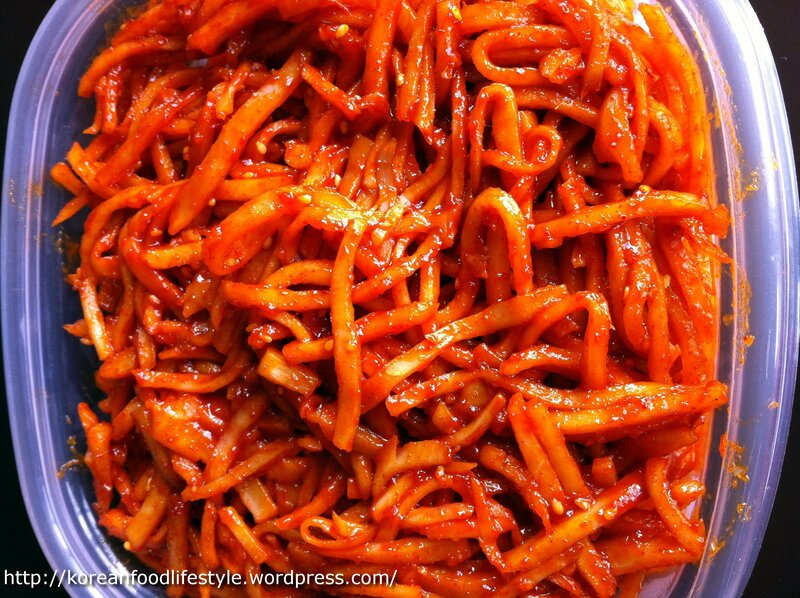 Often referred to as cuttlefish in America, squid is eaten in many forms in Korea. 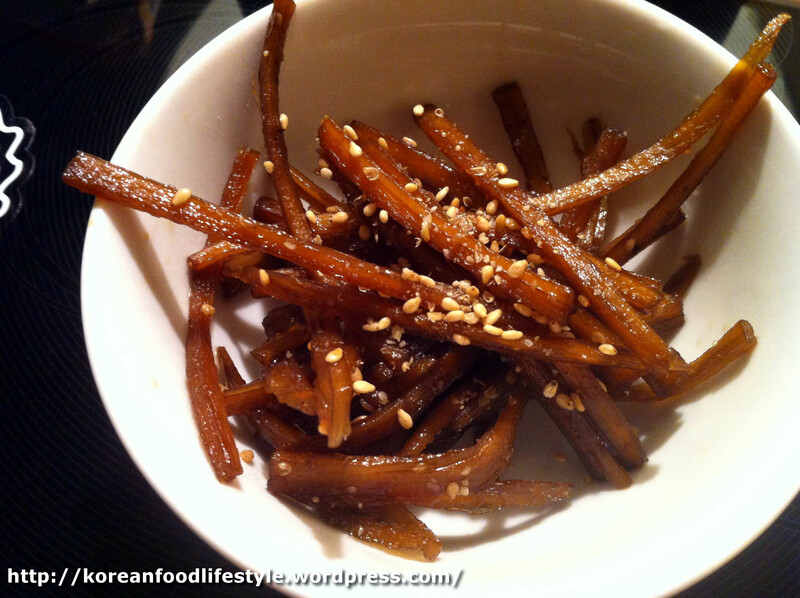 This is a wonderful tasty banchan to accompany rice. If your not a fan of seafood as all, perhaps wait a bit to try this one; however, this has only a very mild seafood taste, a little bit spicy while not overpowering, with a touch of a nutty flavor when garnished with sesame seeds. * NOTE: Adjust the recipe to match how much squid you buy. Different stores will have different sizes. For example, my 1 pound bag in the picture below was a bit more than the “2 handful” standard, so I made a 1.5x batch. The product you find in the store should resemble this. 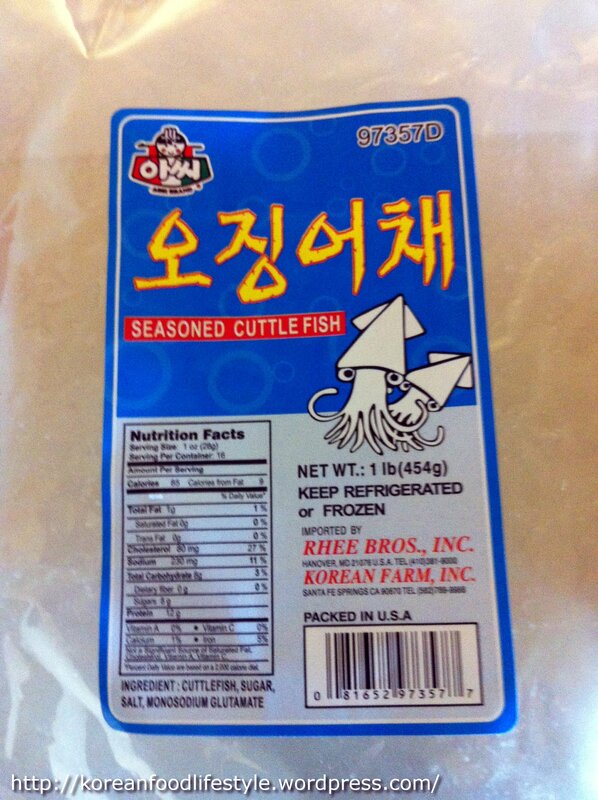 It seems that squid is a dirty word in America, so to soften the blow “cuttlefish” is used instead. Aren’t the little squiddys cute? 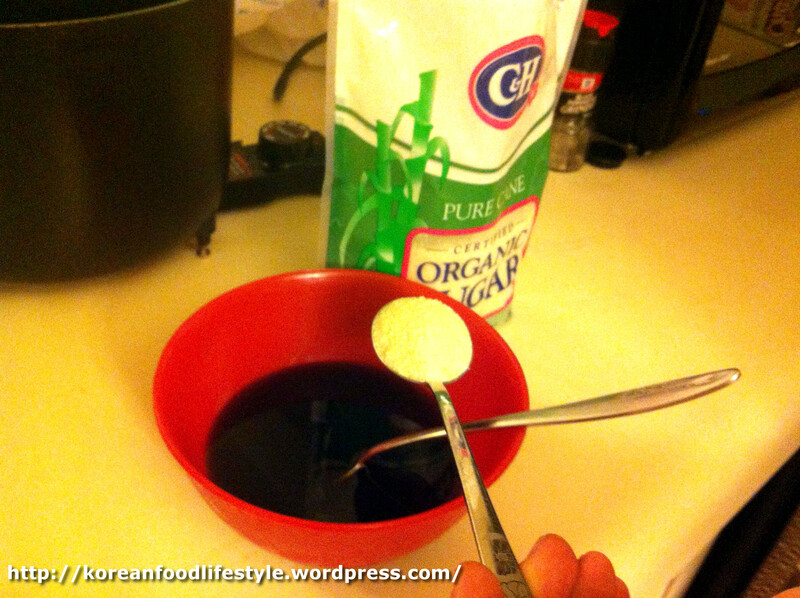 The product you find should already have sugar and salt in it. This product, “Asshi”-brand, is an American brand. It’s all my Korean mart had, although if I had the choice I would have chosen a different brand from Korea. This worked out will however. 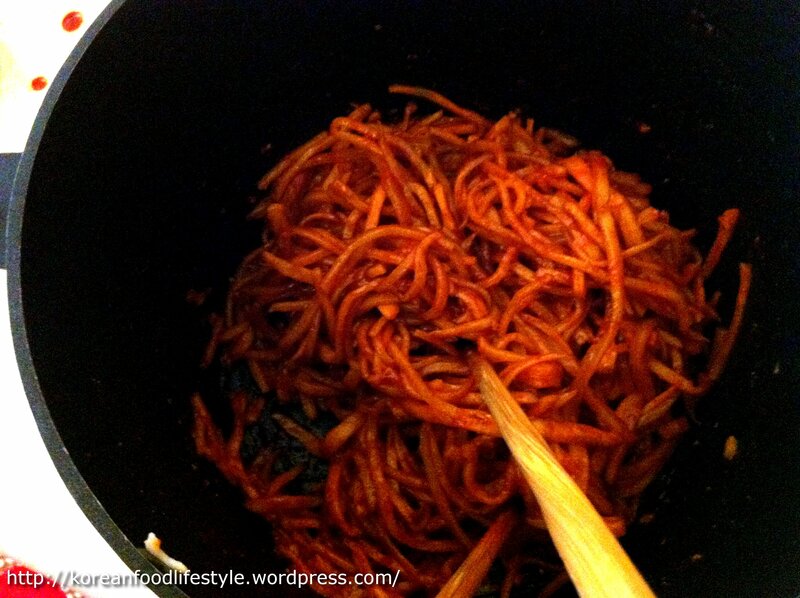 Rinse the squid in lukewarm water for just half a minute of so, it doesn’t need to be very salty. 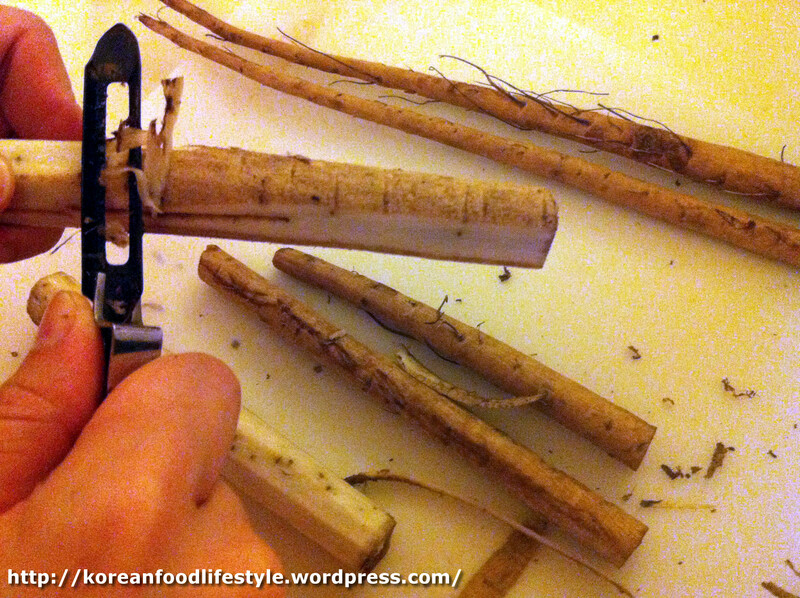 The pieces can be a bit long straight out of the package, so take scissors and cut them roughly into pieces 2-3 inches long. 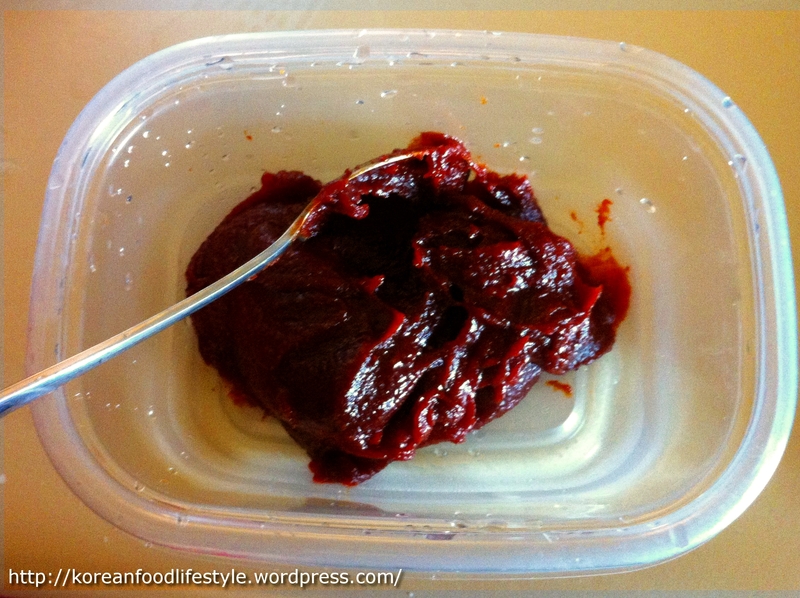 In a medium sized container, scoop out the red pepper paste. 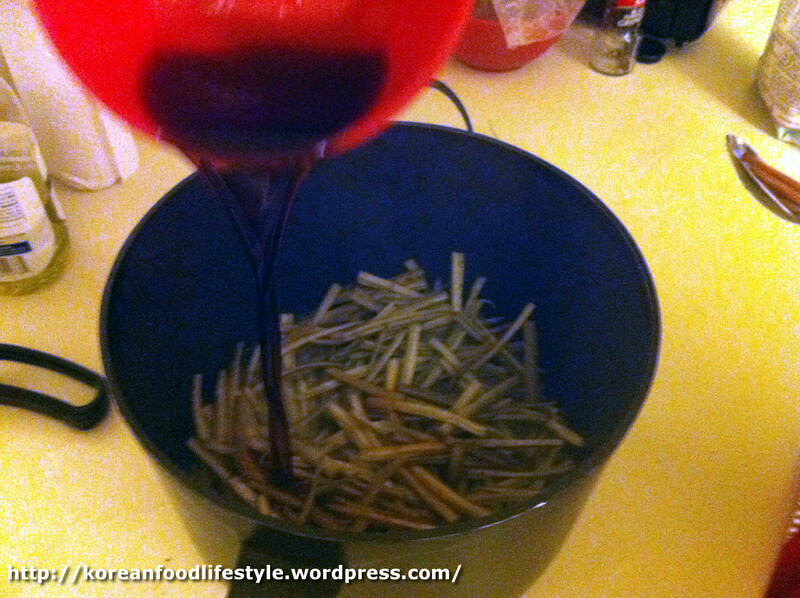 Add the soy sauce, oligosaccharide, and cooking wine. Mix in the minced garlic. Put the mixture in a deep dish frying pan (in this case I used a frying pot) and bring the mixture just to a slight boil. 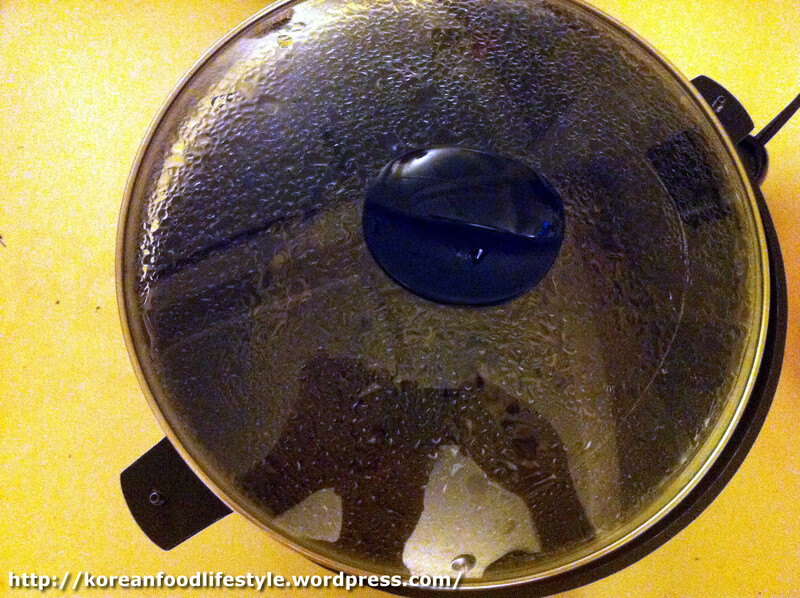 Add the squid that you rinsed and cut into the pan/pot and start to fry. As you are frying add the mayonnaise and keep stirring. Fry the product over medium-high heat until the liquid is reduced to the amount shown below. Not to wet, not too dry. 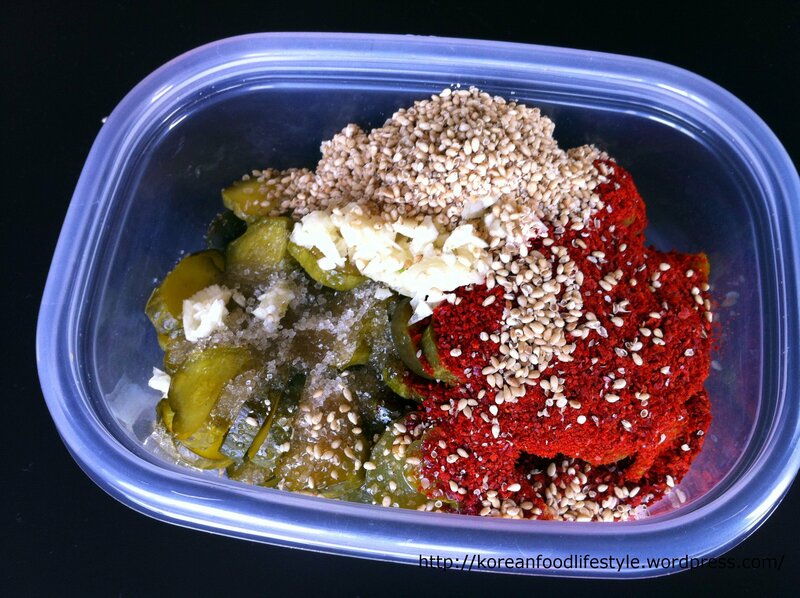 After frying, mix in the sesame seed salt, and store in a secure container in the fridge. 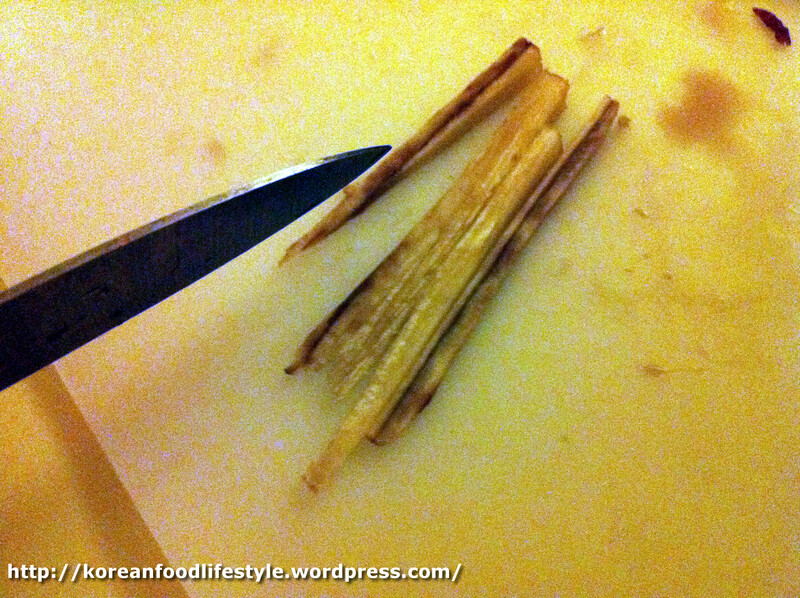 NOTE: To ensure that your banchan lasts a long time in the refrigerator, make sure you read the comments and instructions on my “The Banchan Plan” page. 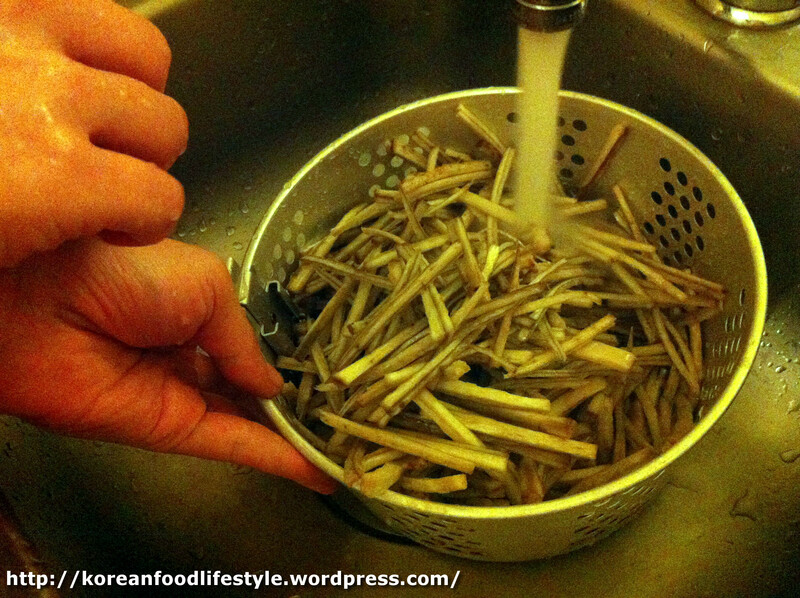 This is long-term banchan, so make sure you are careful when serving and make sure to limit the amount of time exposed to air and/or out of the refrigerator. 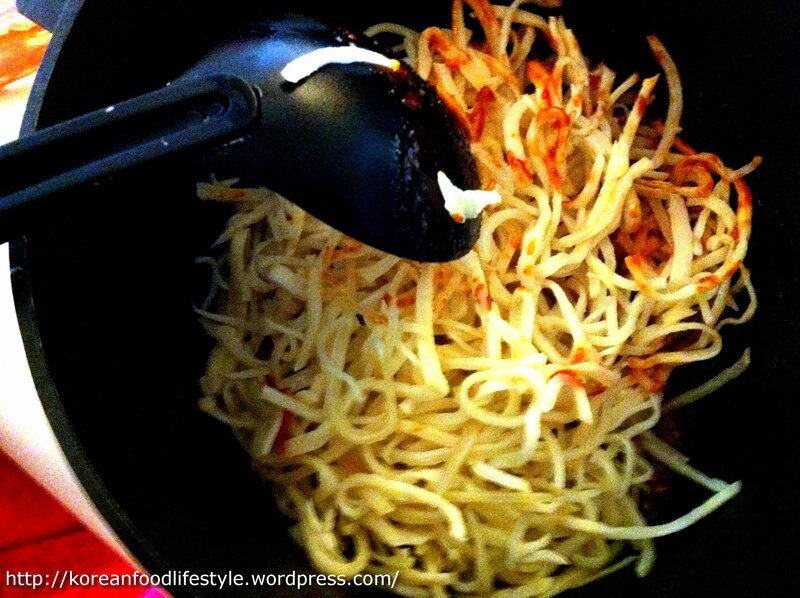 Enjoy your rice with a delectable banchan that is a tasty mix of sweet, sour, nutty, and spicy. 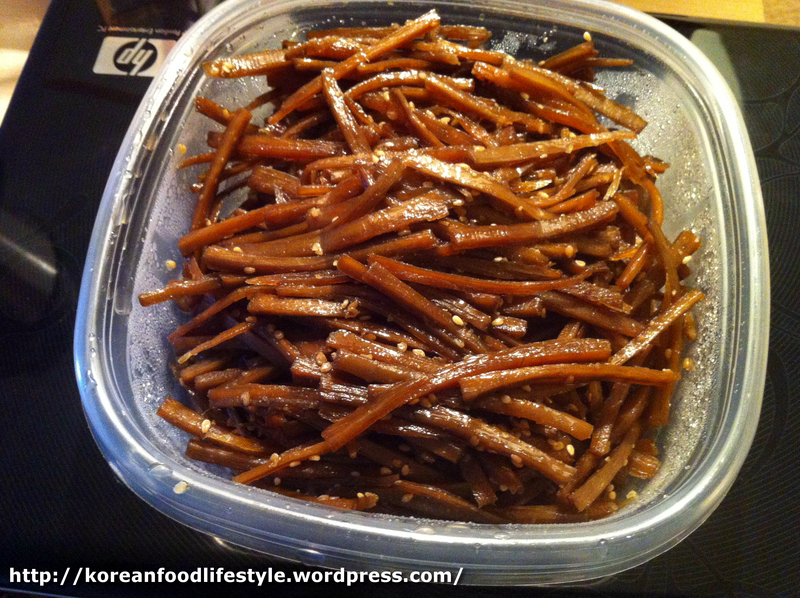 This is one of my favorite side dishes and it is quite easy to make. 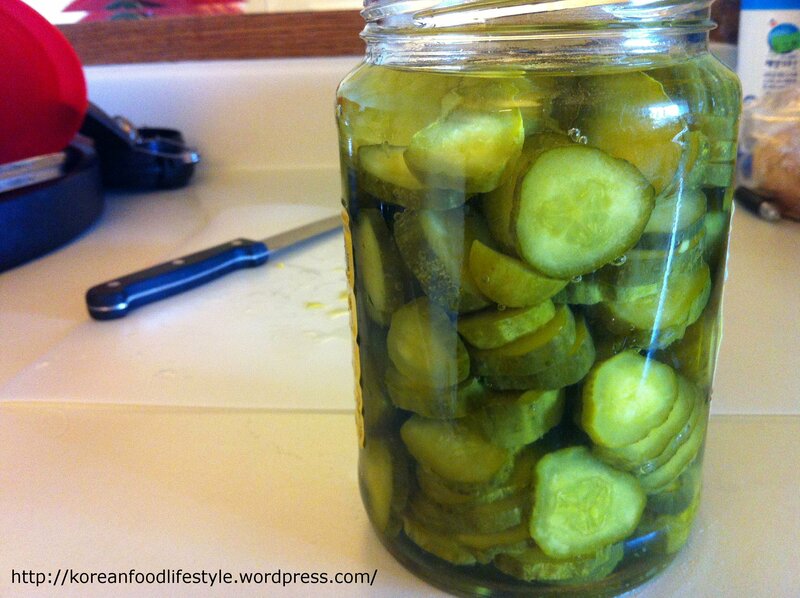 Start with any homemade or store-bought pickles, and in a few minutes you will be ready to eat the transformed product. 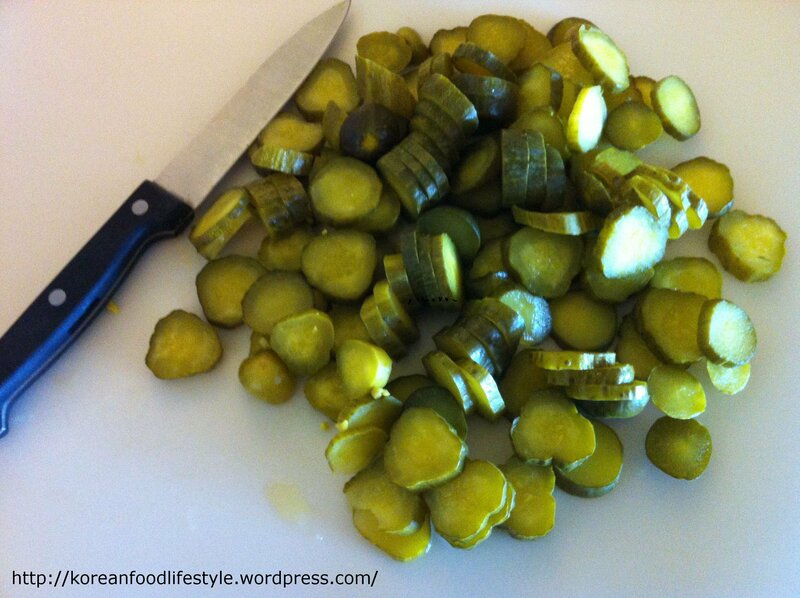 Just start with you average can of dill pickles. 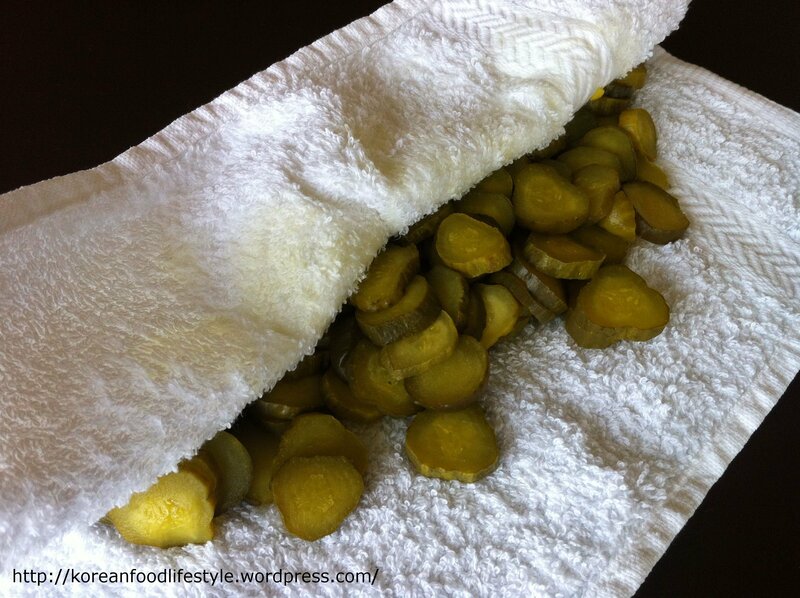 Open them up and, unless you have a good reason to save the pickle juice, toss it down the drain. Slice them up into about the size you see here. 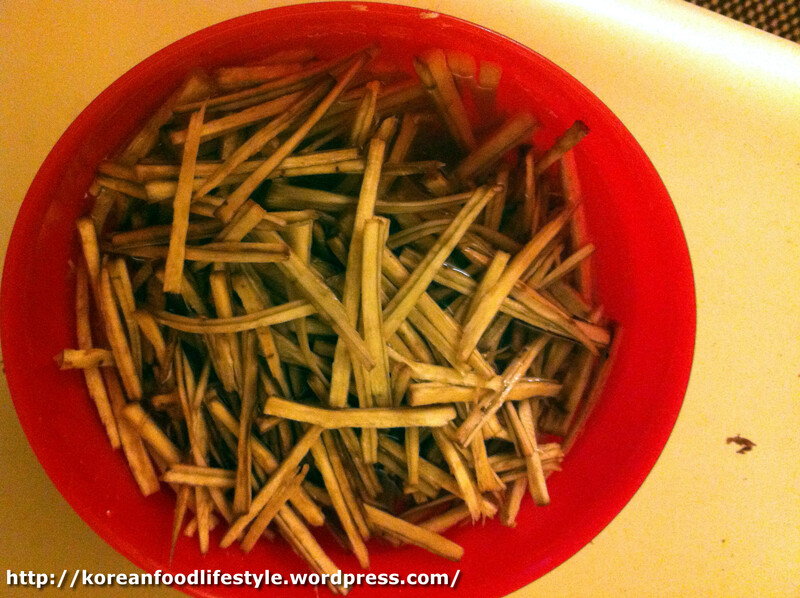 Throw them back in the container they came with and soak them in cool water for 30 minutes. 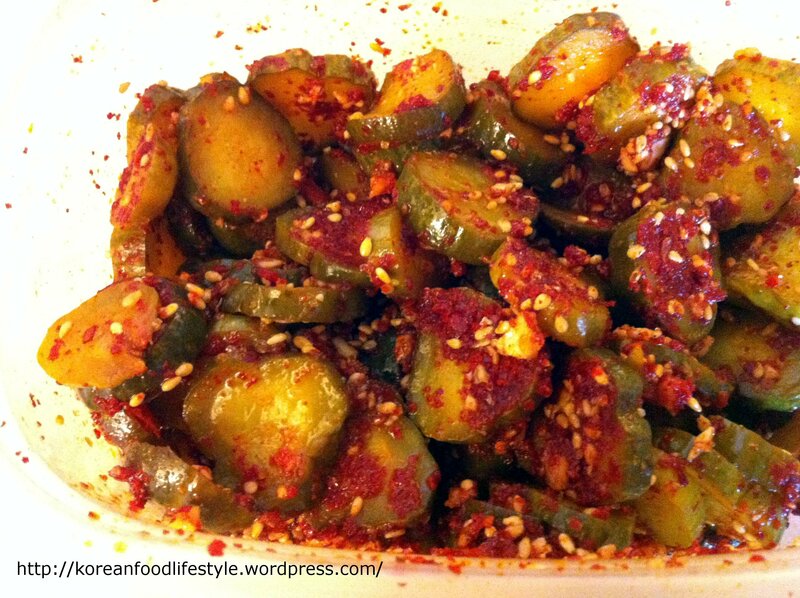 In general, pickles from the store are to salty for this dish, if you have homemade pickles that are less salty, you can decrease the time to compensate. You don’t want them flavorless, you want a little salty and vinegary flavor left, but you don’t want it to be so strong to overpower the ingredients that you are going to add later. Next, you need to press the pickles dry. You can use a cheese cloth, or, as I did not have a cheese cloth in this case, you can use a clean and sanitized (boil for 5-10 minutes after washing) face towel. If the pickles are too wet, the ingredients won’t stick to them very well. Next add the crushed red pepper, sugar, minced garlic, finely chopped green onions (I skipped that ingredient in this batch), sesame seed oil, and sesame seed salt. NOTE: If you like a little more vinegary flavor, you can, at this stage, add a little bit, perhaps 1 tsp to 1 Tbsp depending on taste. 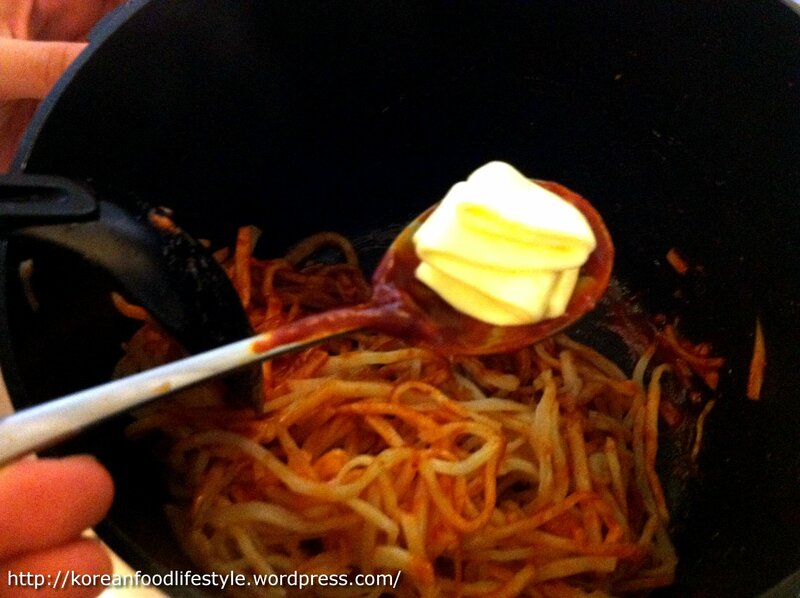 With a cooking glove, mix the ingredients until evenly distributed. 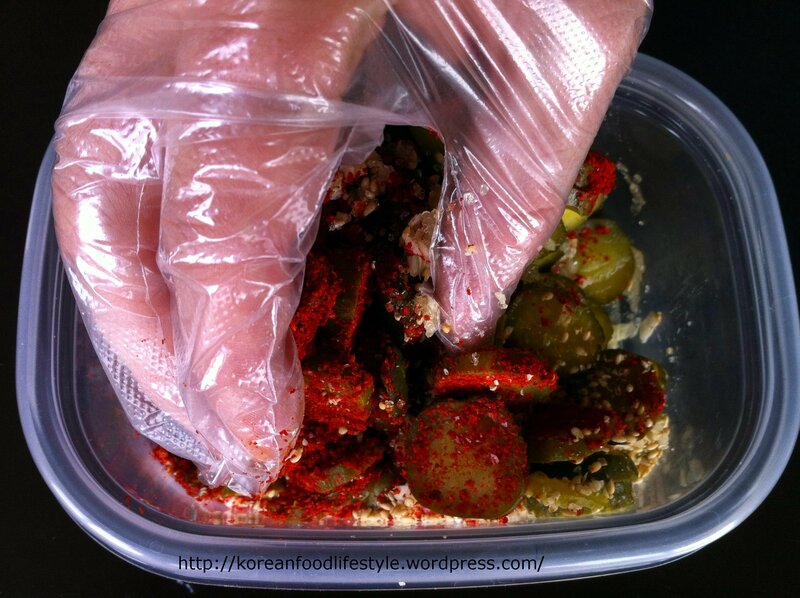 NOTE: As this is a long-term banchan, it is very important not to contaminate it, which is why we use the gloves. Even the littlest bit of bacteria at this stage will reduce the shelf-life considerably. 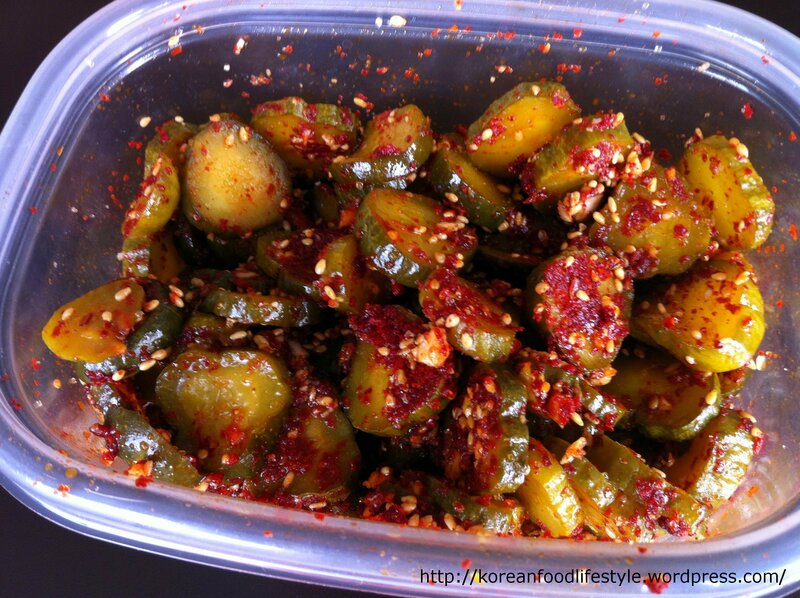 Enjoy with rice along with some other of your favorite banchan!